I became a vegetarian in high school (either sophomore or junior year) and maintained that diet for quite a few years, slowly phasing out egg and dairy as much as possible as time went on. Then, I went fully vegan for a year. I’ve since made an exception for seafood, such as shrimp and occasionally salmon, but I still avoid all dairy, meat, and other animal by-products. For a while now, I’ve been curious about the Whole 30. I know it’s foundation is very much like a paleo diet, and though I hold strong opinions on how to eat- both for health and ethical reasons- I’ve always tried to stay open-minded and I enjoy reading about nutrition and the variety of diets recommended by various experts and other opinionated folks. I’ve followed Melissa Hartwig on social media for some time now, I’ve watched videos on people’s experience, read forums, read the research and anecdotes both for and against the diet plan. This… is going to be hard. To be quite honest, I’m nervous to take on this challenge. I’m nervous to shake up the way I eat and put so many more restrictions in place. I’m scared of being hungry and I’m scared of failing. That said, I’m also excited to take on this challenge. One of the concepts of the Whole 30 is that it isn’t a diet. While that’s not true (it is a diet- just a temporary one) I do appreciate the fact that it is meant to be an experience that is about more than the actual food. 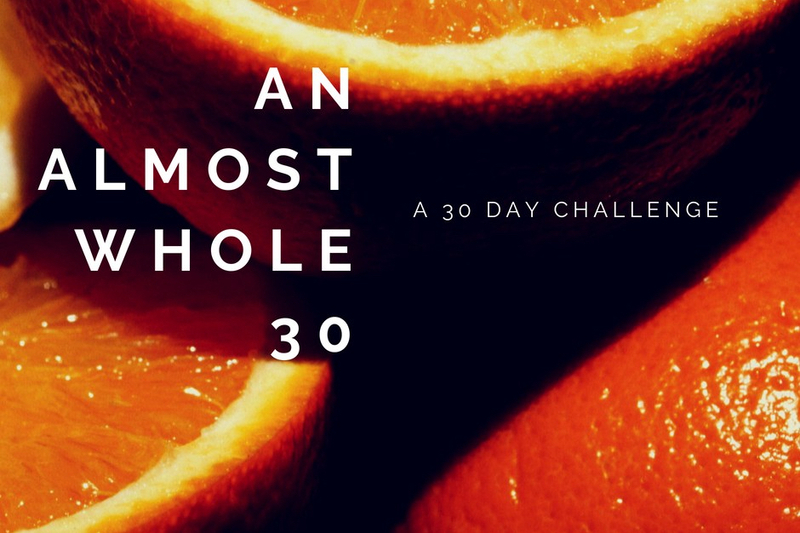 The Whole 30 emphasizes that it will help change the participant’s relationship with food. While I’d love to lose a bit of weight during the next 30 days, more than anything I am hopeful that this challenge will help me “re-set” myself to make better food choices and will help me learn to eat more intuitively. I don’t think I have any sensitive towards gluten or soy or legumes, but who knows? My intention is to allow this challenge to push me towards moderation, healthier food habits, and discipline. If you’d like to follow along as I attempt this slightly modified Whole 30 experiment, please stay tuned! I’ll be posting updates here (after every 5 days or so) and random updates and food pictures on Instagram. Your only job? Eat. Good. Food. The only way this will work is if you give it the full 30 days: no cheats, slips, or “special occasions.” … You must commit to the full program, exactly as written, for the full 30 days. Anything less and we make no claims as to your results, or the chances of your success. Anything less and you are selling yourself—and your potential results—short. It’s only 30 days.